I started my driving lessons when I was about 6 years, on our Premier President (Fiat 1100D). Initially I used to sit on my dad’s lap and try steering the car while he was really steering it. But slowly, as I got used to the steering, my dad started giving me more control. He still would have his hands on the steering wheel but would take over only if I am doing things completely wrong or in case of some emergency. Since I couldn’t reach the pedals, he used to do all the acceleration, braking and shifting gears. In about 12 to 18 months, I was able to steer the car where I wanted, but I still needed my dad as I couldn’t reach the pedals. The next two years I used to drive the car sitting on my dad’s lap and my steering balance improved along with my dad’s confidence in my driving skills and he used to give full control to me. The reason I used the term “steering balance” is that, the cars of those days, didn’t have the power steering. There existed some point in the center of the steering arc, which was neither to the right nor to the left. So even if you hold the steering straight, because of the ‘buffer zone’ of the steering wheel, the car will move either right or left depending on many factors. So, to drive straight, one has to constantly turn to the left or right depending on the road conditions, wheel pressure, number of people in the car, and so on. By the time I could reach the pedals, I had mastered the art of steering the car wherever I wanted. Since the accelerator, brakes and gears were handled by my dad, I had to learn those things, which took another 6 months. By the time I was in the fourth standard, I could handle the car like a seasoned driver. But those days, I was never allowed to take the car out without my dad. I used to drive to the church and whenever we went somewhere I shared the driving with my dad. 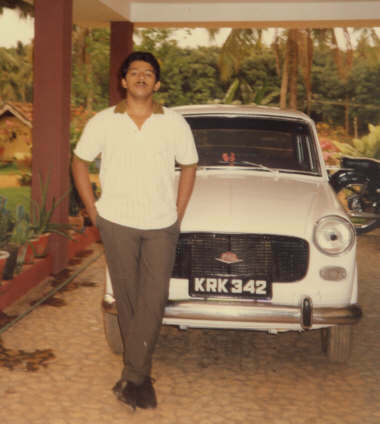 When I was in the 6th standard, I was allowed to take the car out alone. I still remember my first solo drive. It was to my cousin’s house about 3 kilometers from my house. I made it there and back safely. Then I started to drive my grandmother to church on every Friday and Saturday. She had arthritis and couldn’t walk to the church. My grandfather was still in good physical condition and he used to walk to the church and back. He used to say that walking was the secret of his health. We used to go the early morning Mass that started at 5.30AM. I used to get up at 5.00AM, and after brushing my teeth and changing my clothes would drive my grandma to the church. She used to sit in the backseat directly behind the driver’s seat. Since she had great difficulty in walking and was overweight, I used to park the car as close to the church as possible and then help her out of the car and to a chair that was placed close to the rear door for her to minimize the walking. It was during this time that I learned and perfected the art of taking a skid turn. At that time I was doing only a half skid turn, bringing the car parallel to the steps of the church coming from a direction perpendicular to it. I had seen it in some English movie. Since it was early morning, the church was not crowded at all and hence I could do the stunt without being caught. My Grandma was totally oblivious of the stunt that I performed and was happy to see the car parked very close to the steps, so she can get out of the car on to the steps. A few months later, I tried and learned the complete skid turn or the bootleg turn. After helping my grandma to her chair, I would go and park the car away from the steps to make way for other vehicles. In the church’s parking space, I would attempt the U-turn which was more risky. The grass and the dew made it easy at the same time risky. Easy in the sense, the car would skid easily over the grass and risky because it was more difficult to control the skid with the dampness. But I managed to master both the maneuvers with only minor scratches and dents to the car. When I was in 10th standard, my grandma became too weak to go to the church and my morning adventures came to an end. On my 18th birthday, I went and applied for the learner’s license. In those days, one could only apply for the driving test 45 days after taking the learner’s license. So within 2 months after my 18th birthday, I had the license in my hand. Once I got the license, I was allowed to take the car anywhere I wanted. But soon I joined engineering and my driving was limited to holidays and vacations. After a few years, when I was doing my Engineering, my grandfather started to show signs of weakness and wanted to go to the church in the car. During the initial few years, I only needed to drop him at the church. He would walk back with his friends after attending two Masses back-to-back. Whenever I was at home (almost all weekends, study leaves, vacations and so on) I used to take him to the church. On other days, it was my dad’s duty. By the time he was about 85 years, he told us he wanted transport both ways. Since no one was willing to attend two Masses a day, he made a compromise by agreeing to comeback after the first Mass. Whenever I used to take him to church, I used to sit at the back, dozing off. This used to irritate my grandfather and he would start a sermon as soon as the Mass was over and as we were on our way back. I would increase the speed but since he was too old to notice, he was not scared. Then I would keep on pressing the horn button, but he was very persistent and would lecture me about the importance of attending the Mass and the inappropriateness of sleeping in the church till we got home. This routine never varied. My home is situated slightly away from the main road. So once we get off the tarred road, there is another 1.5Kms to reach the house. Half of it is the Panchayat road and rest was through our property. That stretch of 1.5Kms had 3 steep slopes, 5 hairpin curves, and 2 slope-hairpin combos. Since I learned driving on that stretch of road and have driven through it thousands of times, I could cover the distance at high speeds, with few inch clearances and with ease. One of my favorite pastimes was scaring the hell out of people who are new to my driving or to the terrain by the high-speed driving and daredevil maneuvers on my homestretch. It was fun and I was very happy when I gave the scare of his lifetime to good friend of mine (who used to terrorize me with his antics on his Yamaha RD 350). After B.Tech, I went for M. Tech, and as soon as I completed my M. Tech project, I joined Pond’s (I) Ltd., in Pondicherry. So I did most of my driving before I took my license. The only cars that I have driven are Fiat (more than 80,000Kms) and Ambassador (around 10,000Kms). I have driven cars like Volkswagen Beatle, Benz, Standard 2000, Maruti 800, etc. a few kilometers each. After the accident, I got a hand controlled Maruti 800, which I must have driven for about 2000Kms going to the office, going to the beach on Sundays and the driving through the city just for the fun on it. Driving the hand controlled car is a bit tricky. On the steering wheel there is a knob and you steer the car by turning steering wheel using the knob with one hand (just like cranking an engine), while you use the other hand to operate the accelerator/brake. Since the car had automatic transmission, changing gears was unnecessary. Put the gear lever in the drive position, pull the handle towards you to accelerate and push it away from you to decelerate. The one-handed steering using the knob was a difficult skill to master, especially when your sitting balance is very poor. You need to strengthen the muscles in your right arm that you have never used before for driving and more importantly you need to get the hang of it. But once I had driven in that way for a few weeks and got used to it I could steer the car with pinpoint precision weaving in and out of the crowded Madras traffic. My driving skills were put to test one day while I was coming back from the office. The car had the accelerator and brake pedals so it could be driven by people who had their legs at the command. Once I had entered the Cathedral Road (now Dr. Radhakrishnan Salai) and while passing the American Consulate, I had a spasm and my leg pressed on the accelerator pedal with the force only a spasm can generate. The car accelerated as quickly as a Formula One Ferrari and soon I was speeding at more than 100 kmph and still accelerating. I had to use all my driving skills to keep the car from hitting other vehicles using one hand and at the same time trying to get my very persistent and spastic leg from the accelerator pedal using the other hand. After a few minutes of high-speed driving, I was able to pull the leg from the accelerator pedal. I slowed down and parked the car by the side of the road. I was shaking from head to toe by the adrenaline surging through my body. A few minutes later my brother who was accompanying me on his bike caught up with me and started shouting at me. He thought I had accelerated out of sheer recklessness as I sometimes do when we used to go the Basanth Nagar beach on Sunday mornings when the road was empty or whenever there was a straight stretch ahead. But once I told him what had happened, he calmed down, went to the nearest shop and bought two cans of coca cola. We sipped it while I smoked a cigarette. Once my body returned to the normal state, we continued our journey and reached our flat without any further excitement. My brother then took the car to the mechanic and they fashioned a protective metal cover for the pedals so the incident will not be repeated. But that was a hair-raising experience and it’s a miracle that I escaped unscathed. Once I resigned from TCS, my outings became less frequent and in about 6 months I stopped driving for good. hello alexis…. so u started driving at the age of 10… cool 🙂 me too started steering the wheel at the age of 8 ..but that was out of complusion… my dad used to tell me to steer the vehicle…he just wanted me to do it…(he started driving when he was in 10th)…usually the driving lessons happens when we go to my mothers house which was in trichur..in that days NH47 didnt had this much traffic..so it was easy…but the problem was whenver i didnt steer the vehichle properly i used to get a knock in my head :D…and i didnt liked that…and the reason he gave me is that when he studied drving his “ashan” (driving teacher) used to knock his head like that…and he says if u get a knock in your head u wont repaeat that mistake.. 😀 😀 .. the driving lesson didnt lasted long as i used to sit in the back side, to avoid dads complusory driving lessons. What an absorbing narrative. You seem to be a natural driver. I was never comfortable driving, but have seen the comfort and ease with which some people even ladies drive. And you seem to enjoy it too. I love long drives as long as someone else is driving. This is beacuse I tend to get lost in thought and one needs to concentrate while driving. Maybe these new cars will come with hand drive so you can once again go for a drive. chackochan: Yes, it was a nice to learn driving early. My dad learned to drive very late. I think after 22 or 23. So he wanted my brother and I to learn it early. But as you had mentioned passing out from one’s parent’s ‘driving school’ is one of the most difficult tasks, especially when the instructor is an exceptional driver. My dad used to talk to me about the importance of driving carefully and was very tough whenever I forgot some finer points like forgetting to downshift and relying only on brakes to reduce speed. When I think back, his eye for detail and insistence on correcting even the slightest mistake is one of the main factors that made me a good driver. Also he never asked me to reduce speed when I opened up the vehicle on good roads after I had majored from his school. In fact, he encouraged it. Since I learned driving in a very rough terrain with untarred roads, steep slopes, acute turns, and potholes, driving on good roads was very easy for me. Yes, those days NH47 was a nice place to learn high speed driving as the traffic was very light especially during early mornings. Hand-controlled cars are available. Because converting a car with automatic transmission to a hand-controlled one is an easy job. You get conversion kits. But I don’t think, I will drive again as there is no point. All I will be able to do is drive around and come back. None of the places are wheelchair accessible (including many hospitals). It was the main reason I stopped driving. And I don’t see any move towards accessible buildings and facilities in the near future. a friend of mine drives hand controlled car..
a cousin of mine was like u.. he started to drive at a very young age.. infact one day my aunt was stunned to see the car comming out of the carshed by itself.. my cousin was so short that his head was not visible from where she stood..!! but i felt so sad to read that u go only to hospitals.. but why..? cant u go to other places too..? even if u have to go in the ambulance..? After coming back from any journey (even it is a trip of 10Kms) I will be down for at least a week with severe body pain thanks to the wonderful roads we have. After the accident, I have never visited my home (where I grew up and my parents still live), which is about 45Kms from here, because the travel is too tough and I will have to stuff myself with painkillers once I reach there. So they visit me every week. So even though I would like very much to see my home, I have to satisfy myself with the videos and photographs of the place. It is hard, but it is better than staying in bed with all parts of the body aching and legs twisting and turning with severe spasms. Alexis, I lost someone I loved in a bike accident and everytime I see a bike I want to ride, but somehow I just can’t..Nobody understands why can’t I ride a bike, when I was one of the best riders of my time( yep bike..the lessons started on my dad’s enfield!! !..like your dad taught you to hold the steering..my dad taught me to ride a bike!) I guess we all wish we could do things..
That made fascinating reading. I could feel the panic and anxiety that must have gripped you when the car started speeding due to the accidental stepping on the accelerator. I am sure that you will again start to drive in one of these new models. I am sorry I had not read the other comments before commenting. I see that you get tired from rides these days. So it is probably not desirable to start driving again. Dude , When I get a car (I dont know when, coz I donno how to drive a car yet ) , I will pop over to your home and take you for a spin , so you can travel in a new age car ..and thats a promise OK ? And if you can pillion ride a bike , i can drive over and take u for a spin on my bike. Very interesting narration. I am very sad that you can’t take one of those new machines ‘for a spin’ as you said. Sarah: I can understand the feeling. You learned to ride on a bullet!!! Bullet is my favorite bike, but I started riding a bullet when I bought one when I was 20. Your dad is a cool guy, giving you a lot of wonderful memories, the songs, the madhura kallu and fish fry at Karimpumkala, and now the Bullet lessons. Convey my regards to him. Aashik: Thank you very much for the offer. But it is not the availability of cars that is preventing me from driving. It is my physical limitations. My sitting balance is very poor. I can’t even sit in a chair without support. So riding pillion is impossible. Otherwise I would have done that on tmy brother’s Kawasaki Eliminator. I used to love driving and used to argue with chechi abt who gets to drive when we went to places together..
hmmm .. sorry i didnt think it would be so difficult..
but still somewhere nearby.. just a km or two.. where u can enjoy the breeze, silence and scenery.. shall i come there and take u out..? nothing beats the 1100 ! Alexis: My dad would place me infront of him in the bike and let me hold the handles.. He would balance with his legs, at the age of 10, I felt I was in control and riding a bike!! He taught me the finer skills of riding by the time I was 15..We used to go for long rides on the bike..The day he sold the bike, we both cried..
Conveying regards to him, I wish i could.. I don’t know where he is…. I have searched everywhere. Hi Alex nice post, I remember when I first startrd learning to drive I was a lot older than you, I accidently pressed the gas pedal instead of the brakes and went into a store. Lucky for me I did not hurt any one and I was not hurt either. Just all the canned food that was stacked on the other side of the wall was all over the floor, so I spent the next hour putting all the cans back while my hands and legs were still shaking. Nice Post. Driving Ambassador and Fiat’s really took the skill out of you than the new power steered ones. I still love our old Premier 138 D which had the gears on the side of the steering. That was superb. And when you talk about steering balance and buffer zone, I can really co-relate it with my driving. For me it was my uncle (who was a drvier himself) who taught me the nuances, even though it was dad who started teaching me. He would tell that if you can see both ends of bonnets, press A B C’s of a car fully then you can drive that car without any problems. Well One Day the whole world will become so easy for you to drive around so that you can visit any place you would like to visit. I hope and I pray. Thanks for this wonderful blog. What happened to my previous comment!! Some part got chopped off! This was the narrative that brought back memories of Nazir to me.. It was lovely reading your experiences. Wow, to have started driving at such an early age is amazing. I love driving too. It is my “chill” time whenever I take the car out. I wish to make a long comment on this post, so pray that I don’t get bored & tired of typing (very slow). First things first, a fantastic post, loved it. I have heard the accelerator story through mail (when I was planning to do a story on disabled drivers). Sir, I may be repeating myself for 100th time, but I need to say this again; the reason I regard you as my Hero is your ability to vividly remembering pleasant past without getting depressed by your present. I’ve never thought about driving (even my trials on electronic wheelchairs have been failures till date). But I can ride pillion on scooters (not on bikes because the silencer hurts my leg), go for drives and move around with the help of others. Salutes to you, keep such posts coming, they help me to cope with my life in a better way. @Aashik: “Hugs” for making that offer to Alexis, you’re a brave man. thanu: Driving and riding are two things that I will ever get tired of. Geo: I also go to the same church 🙂 I wish you all the best in fulfilling your dream. Enticer…good bike; but I still prefer the Bullet. -poison-: I agree. I had read your post about your 1100. Why have you disabled comments on your site? lalitha: You were lucky to escape unharmed. Silverine has the same experience when she had her driving lessons. Dhanush: “He would tell that if you can see both ends of bonnets, press A B C’s of a car fully then you can drive that car without any problems.” I can’t agree more. I am also praying for that. Thanks buddy. very intense story.. I can imagine how much you must be missing driving. The skid turns are indeed too risky, thank god you got saved there..
once, I had this 180 deg skid turn experience, and I was scared the hell out of it, I was merging on a highway from a ramp, and my car started skidding, turned 180 deg, stopped exactly between the small triangular, just enough area between the ramp and the highway, which was just enough wide for my car!!! It was not an intentional skid, probably my car started skidding because of slight damp road with little dirzzle of rain, sharp turning ramp and some loose gravel on the road. I needed to gather courage to drive again, I just waited for a few mins facing incoming traffic on my two sides. Boy, I missed a couple of heartbits then. I don’t own a car. Papa takes me on his scooter even to the office & then carries me inside. If we go for 2nd show we hire an auto. Fascinating read. You convey everything very powerfully! I haven’t had the opportunity to get into driving a lot, perhaps I will someday feel the emotions you do. Till date, when I’m home, we have a driver. When I’m here, I don’t drive at all as I live near the campus. venus: Skid turns if not done properly is very dangerous. You are very lucky to do an unintentional 180 degree skid turn and escape unscathed. But it must have been quite an experience. Paresh: I thought the Maruti in which you came for the interview was your car. Convey my regards to your dad. He is a great man. Thanks!! My parents are great. I tell all your stories to mom (after editing of course). Papa had borrowed that car from a collegue, we couldn’t have reached that far riding a Kinetic Honda. I’ll pass on your regards to him. hey if you need a drive some time, i am game..will be visiting kochi soon..just let me know. Dewaker: Thanks buddy. It really was fun. The road with its curves and slopes are still there, but now it is tarred, so driving is easier now. Mind Curry: Thanks buddy. I too loved driving in the rain, but it was difficult without the bright headlamps of today’s cars and it was always difficult when the big vehicles didn’t dim their lights. How is you hand. Hope everything back to normal and functioning properly. Great post as usual. You should seriously think about writing an autobiography. You narate incidents so well that the person who reads it feels as if its happening in front of his/her eyes. Sad that you can’t drive anymore. Maybe, someday in the future, India will have enuf facilities so that you will feel like going out again. Hoping that day will come soon. silverine: Hope to read that post soon. Suji: Thank you Suji. You are reading my autobiography :-). I too hope for that day.